Shotcrete vs Gunite - What is the difference? Hawaiian Pools builds Shotcrete pools, which is an extremely solid and heavy-duty type of concrete. 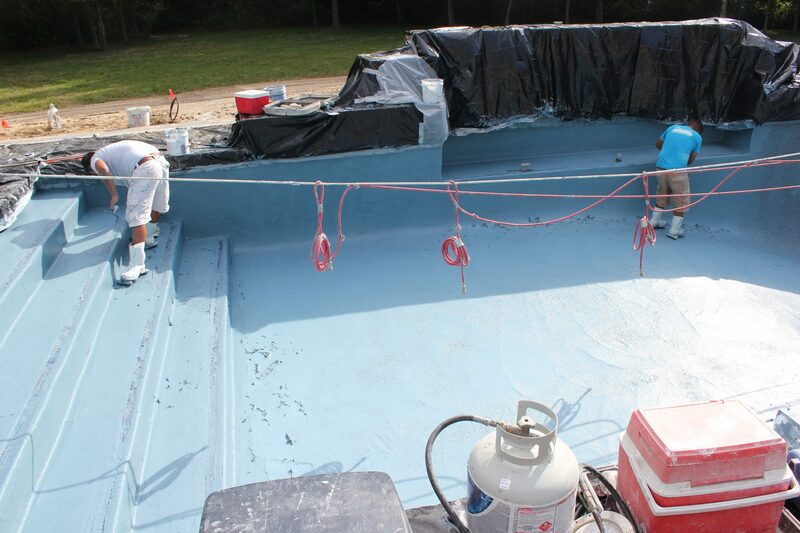 Many in the pool industry use and have used for decades the word Gunite, therefore that is the word most people know. 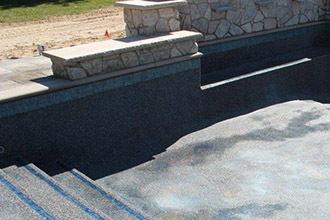 The end-result of both products is the same whether you install Gunite or Shotcrete. It is the way the “concrete” is mixed and when the water is added to the mix that separates the two. Gunite is a building material consisting of a mixture of cement, sand and water. 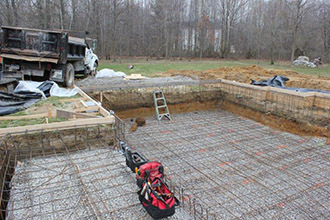 When building a pool, the material is sprayed under pneumatic pressure onto rebar (steel) reinforcement and carved to custom shapes. It is the same for Shotcrete. However, with Gunite, the water is added to a dry mix at the nozzle of a “gun”. When Hawaiian Pools installs Shotcrete, the cement is mixed with water and then is sprayed. The benefit of Shotcrete is that it has less concrete dust during application and is thus usually preferable for indoor as well as some outdoor conditions. 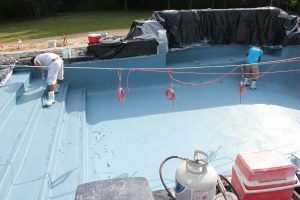 Hawaiian Pools will meet with you on-site to review the details of your pool project. 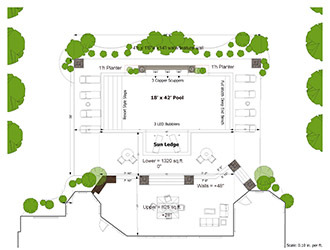 We will physically lay out the design with forms to set the exact location and shape, along with pool grade elevation. 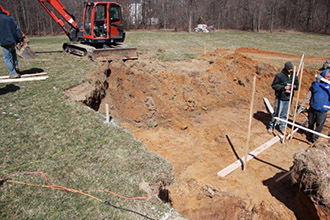 An excavator is used to dig the hole to the pool’s design specifications. 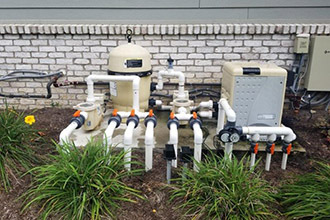 Normally, barring inclement weather conditions, this procedure can be accomplished in one day depending on the size and depth of your structure. Next, the steel reinforcement grid is installed. Some of the plumbing, such as skimmer units, main drains, and wall fittings along with any other pertinent fittings are then installed, prior to the shotcrete application. 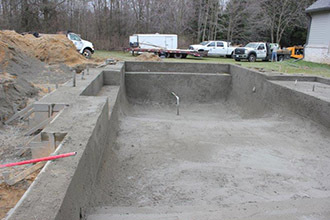 Probably the most exciting step, Shotcrete is a wet-mix application of concrete material that is pneumatically applied and formed into the shape of your pool. This process results in an extremely strong and compacted monolithic concrete structure. Coping is the 1’ perimeter stone around the pool (deck level). This acts as the functional and decorative cap and finishes to the pool beam (wall). Ceramic tile is installed at the waterline level of the pool just below the coping. Typically, the tile is 6” x 6”. It is also both functional and decorative. Installation of the PVC piping and placement of the pool equipment such as the pump, heater, filter, and sanitizer will eventually allow for water from the pool to be drawn back to the pump through an in-wall surface skimmer and from the main drain assemblies, typically located on the floor of the deep end. Getting closer to completion, it is now time for the surrounding decking for the pool, whether it is a style of concrete, paver stones or a combination of these. 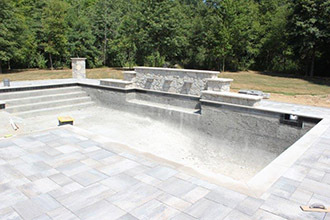 Accent tile is now added to the ledges, steps, and benches and then an interior finish, which is a mixture of crushed quartz and cement, is hand troweled onto the shotcrete surface, beautifying the pool. There are many choices of interior finishes, textures, and colors. Depending on the material, this can be a two- day process. You are now ready for WATER! View more photos of Shotcrete/Gunite pools in our Portfolio.